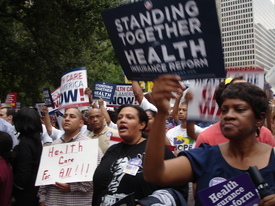 HOUSTON – About 2000 supporters of health care reform attended a rally called by Organizing for America (OFA) at Houston City Hall on in spite of raging thunderstorms and the last of the summer heat. The rally was endorsed by OFA, Harris County Democratic Party, Harris County AFL-CIO, SEIU and Justice for Janitors. The crowd included members of many unions and organizations, including Carpenter’s, HOPE, ACORN, Jobs with Justice, CWA, IBEW, Teamsters, AFSCME and others. Nurses, doctors, patients and health care advocates were in the rally. There were about 100 people present who were opposed to health care reform sporting obscene signs declaring “Up yours, Obama.” They were easily drowned out by the people supporting health care reform. Houston police officers kept a watchful eye on them and prevented any violence. A close friend told this reporter he had a “close encounter with an 18-wheeler” last June which resulted in a broken wrist. He had insurance since he works for a major corporation, but the total bill was $12,000 and the insurance company stuck him with a $6000 bill. He pointed out that the health care system is broken and he among others attending the rally advocated universal health care and support HR676. Rep. Green also stated it was preposterous to suggest that any member of Congress, Republican or Democrat would vote to pull the plug on anyone’s grandmother.